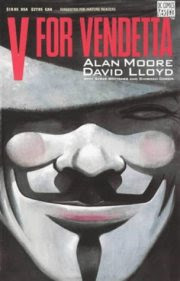 Just re-viewed snippets from the 2005 film "V for Vendetta." What particularly stood out this time was the cornucopia of v's uttered by the character of V to the Natalie Portman character. Alas, though of it days before and a day after but not on the day. Hm. Irony, this is thy name. what a sentence! Who knew so many V's could coexist in the same sentence. Portman's 'British-oid' accent bothered me, but it's a good movie overall.